Rust has no GC and you can't write some kind of code that you ever wrote in other languages. The typical case is recursive data structures like list, tree and graph. By looking for documents or articles, you will find types like the following. You may be terrified because it seems like monad stacks in Haskell. These documents usually start from "Let's implement tree structure in Rust" , explain why these types are required and then extend it to multi-threaded variants. But in my blog however, will explain in the reverse order because I thought it would be easier to understand for readers. This article is the first step. In my opinion, I think the nesting type reference_counting<internal_mutability<T>> is like a design pattern in Rust language and single-threaded and multi-threaded variants share the same intrinsics. In this article, you will learn why the type Arc<Mutex<T>> is required in multi-threaded programming. Let's start from a small experiment. In this experiment, you pass a reference to a spawned thread. However, this code is not compilable. The error says that compiler thinks the thread is possibly running after the v got out of scope. For us programmers, it is not possible though, the compiler is conservative. Changing the closure to move closure as compiler's advice will succeed compile. The error says that v is moved into the first thread and not able to capture in the second thread. As the note says, if the value is Copy and copy on move then the code is runnable. Arc can solve this problem. Arc or Atomically Reference Counted is a smart pointer which implements thread-safe reference counting. Calling Arc::clone clones the ownership. 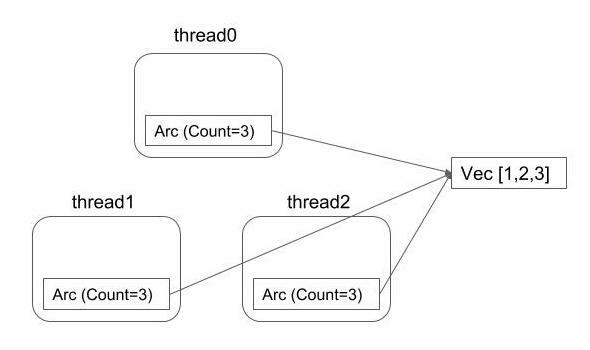 So in the following code, there are totally three clones of read-only ownerships and two of the three are moved to two spawned threads. As it is reference counted, the last one to drop will drop the wrapped value. This is like a designed pattern in Rust. The single-threaded variant Rc is designed in the same way. You may call clone method instead to clone the ownership but calling Arc::clone is advised so it is obvious for code readers to find it doesn't clone the entire data but clone the ownership only. Let's mutably borrow from v0 and v1. As you easily imagine because the Arc was mentioned read-only, the compiler rejects this code. In this the last experiment. In experiment 4, the problem was that Arc is only capable of returning immutable borrow. So the idea is doing some trick so it is mutable behind immutable borrow. It is Mutex. Why Mutex is able to mutate the value behind the immutable borrow is that it takes exclusive lock runtime to access the value. Such like Mutex that doesn't use static borrow checker but do the same check in runtime is called "Internal Mutability". The single-threaded variant of Mutex is RefCell. You can learn why Arc<RefCell<T>> can not be used here by reading this official document but in short, RefCell is not Sync. This will be explained in the later articles.